When we develop a new feature at Jimdo, one thought always takes priority: Everything about your website should be as easy as possible. We noticed that lots of Jimdo customers create multiple websites with us, which obviously we love to see. But we also noticed that managing multiple websites with different logins could be a pain. We thought it would be better to just have one login for all your websites—and even be able to log in with Facebook or Google if that’s what you prefer. That’s why we’re giving every customer their own user account, where you can easily access all your websites from one place—your dashboard! So, what exactly is changing? Read on to find out. We’ll be releasing this feature to customers from today, so when your website is ready, you’ll see a notification when you log in. Follow the on-screen instructions, and you’ll be prompted to create your new account and log in. Instead of signing in with your website URL like in the before-time, you’ll sign in with an email address or with a Facebook or Google account. Once you register for your user account and sign in with your shiny new login credentials, you’ll then be able to see all your websites from your central dashboard. You might be thinking “Umm, guys, don’t I already have an account?” Yes! By going through these steps, you’re just transitioning to an account that is linked to your email address. Nothing will change on your website, and this won’t affect your contract or subscription. The difference: Until now you logged in (on each website individually) with your domain and password. Once you’ve created a user account, you can log in with your email address and password. Alternatively, you can connect your new account to Facebook or Google and login via these services. Your user account is easier and safer to use. You don’t need to remember your domain and the associated password for each of your websites. In addition, it’s more convenient to manage multiple websites at the same time. Because your new account is linked to all websites and accessible via the Dashboard with one click. Good to know: For us at Jimdo, the user accounts also make support for our customers easier and more effective. “One customer = one account”—so we have a better overview and can best support you. 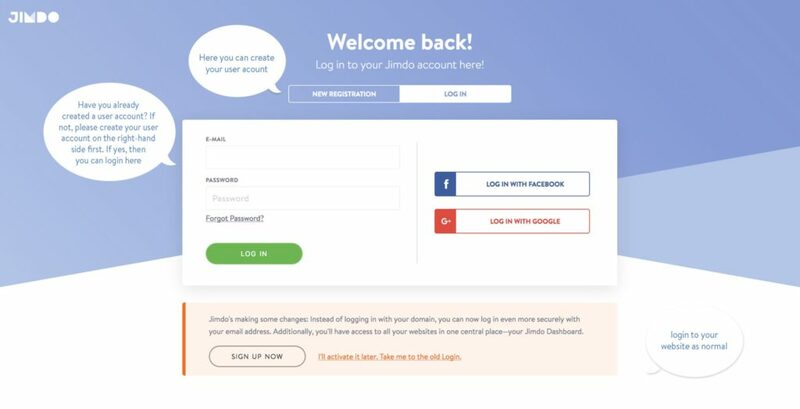 If you create a Jimdo website that requires multiple users to access the page, you can register a separate shared Jimdo user account for the shared page and connect the Jimdo website to it. Please note, however, that the sharing of login credentials is undertaken at your own risk and Jimdo assumes no liability for such actions and their results. Have you already registered a user account with your email address? Then go to jimdo.com, click on “Login” and use the form on the left! Don’t have an account yet, but want to create one? Then visit jimdo.com, select “Login” and click “Register” on the right. You want to log in with your domain as usual? Click “Login” on your website or type your domain in the browser and add “/ login” e.g. www.mydomain.com/login. Dashboard: You will automatically reach this area after login. Here you can see a dashboard with your website/websites. A preview Header of each of your websites is then shown. Just choose the website you want and open or edit your website. If you just click on the website, it will automatically take you to the Menu Editor of that website. To go back, just choose the “Dashboard” option under “My Account” in your Menu. If all of your websites aren’t listed you can just click on “connect a website” put in your domain name and password as you would normally, then it will be attached. So from then on, your login screen will automatically take you to your user account instead of the individual website. Profile: This is where you can upload a profile photo and connect your Facebook or Google account. If you’re already connected to one of these platforms then your photo will be automatically uploaded from there. You can, of course, change it at any time. The photo is displayed in the dialog with our support. So starting soon you’ll gradually get the notifications and can create your user account. Don’t worry if you don’t have the option at first, it will take a while for this feature to become available to all our users. Exciting times! We’re looking forward to your reactions and hope you like the new user account to make Jimdo even better for you!